Many thanks for the incredible trip. The experience ranks right up there in the Top 5 Coolest Things I've Ever Done list. I took the Northeast Vietnam tour through some of the most spectacular scenery of my life. I was a little apprehensive before the trip since, although I had a motorcycle license, I had never been outside a car park on a bike. Although my first introduction to non-car park riding was in busy Hanoi traffic, everything went smoothly. The Minsks are a piece of cake to ride (even if a little smoky). Our guide was superbly prepared, conscientious and thorough. He also was funny as hell! My favorite aspect of the tour was the human interaction along the road. I stopped in one small village to take a picture. Before I knew it I was surrounded by friendly locals inviting me into their house for a drink and politely inquiring about my marriage status (lol!). 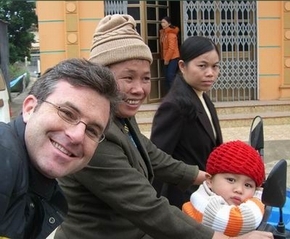 It was one of many touching interactions with the friendly Vietnamese people.